Moose, about a year old, atop Freel Peak (10,886 feet) in September, 2015. Moose is a mutt (lab, pit and whoknowswhat) that we adopted from the Nevada Humane Society at about eight weeks of age in the fall of 2014. 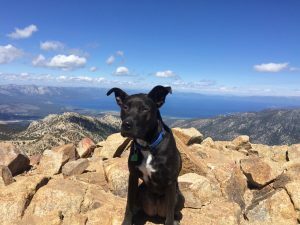 When he was about four months old, we took him on his first hike – the Hunter Creek Falls trail on the outskirts of Reno. Since then, if hiking or camping, he’s alongside. As I’ve re-discovered and explored more and more of the Reno-Tahoe area, and beyond, I decided to write about some of these experiences and places. Thus, MooseHikesdotcom. This is not meant to be a guide, per se, though if it can help at all, great. I don’t have a ton of elaborate gear, though I’ve been investing more on the backpacking side of things and will probably note some of that here. More so, I think I’m just looking to chronicle some of these trips and talk about them beyond the “Great hike today” post on Instagram or Facebook. We’re fortunate to live where we live, with the beauty of Lake Tahoe and awesome expanse of the Sierra Nevada and beyond in such proximity. I’ve lived in Reno for 21 years I took that for granted for much of that time. Getting some exercise for a puppy named Moose has helped change that.